Like the best gas station treats that tempt even the most mature adults on a good road trip, gummies cater to that need to chew on something sweet while basking in the sunshine. With a little infused oil thrown in the mix, these gummies add a major boost to the sugar high of yesteryear. If you want a play-by-play (including how to make your own infused oil), follow along with the recipe we learned from by RuffHouse Studios: search "How to Make Cannabis Gummies (With Infused Coconut Oil) Cannabasics #86" on YouTube. To make these treats into those fun shapes that make your mouth water just by looking at them, it'll take a silicone mold or molds. Gummy bear molds can be found easily online for fairly cheap from most major retailers. Or, you can keep an eye on the clearance racks around town for a good deal, like this hand symbol-shaped tray, which was a steal for less than $4 at Urban Outfitters this summer. Bring the oil and water to a low boil in a saucepan over medium-high heat, stirring constantly. Add plain gelatin one or two packets at a time, stirring until it's mostly incorporated. Add the Jell-O mix and stir for about five minutes until fully combined and the mix starts to come to a rolling boil. From here, move quickly as the mix starts to set up fairly fast. Spray your silicone mold(s) with cooking spray and use a glass with a pour spout or a dropper to put the mix into each well. 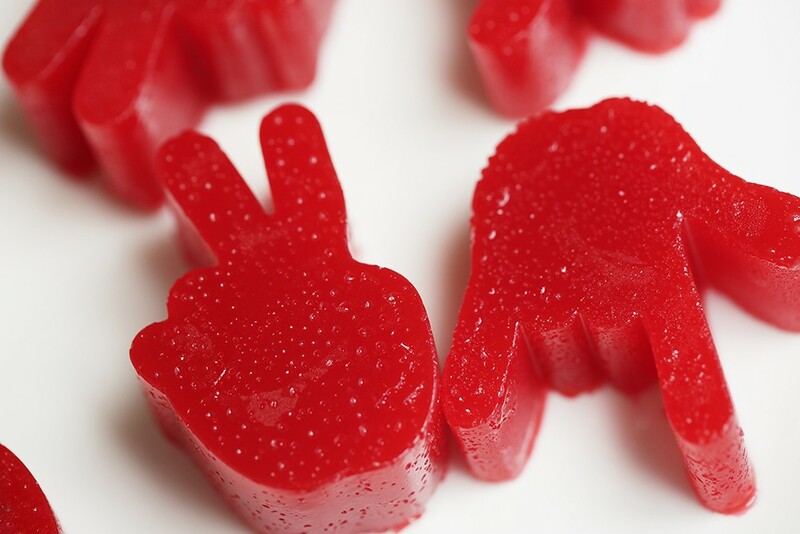 Cool in the fridge for at least an hour, then pop the candies out of the mold and store them in an airtight container in the fridge before eating. With any edible, less is more until you know its power, and unlike those gas station gummy bears, ya can't eat a whole bag of these. It's tempting, but do yourself a favor and don't. Seriously. And a cautionary tale from a friend: If you eat a gummy before bed, you might wake up super high the next morning and have to call in sick, so be mindful of your timing as well. The original print version of this article was headlined "Yummy Gummies"